The winter season is almost behind us, which means it’s time we start thinking about the long days of summer, barbecues, backyard games, iced tea, and the sweet fragrance of blooming flowers. 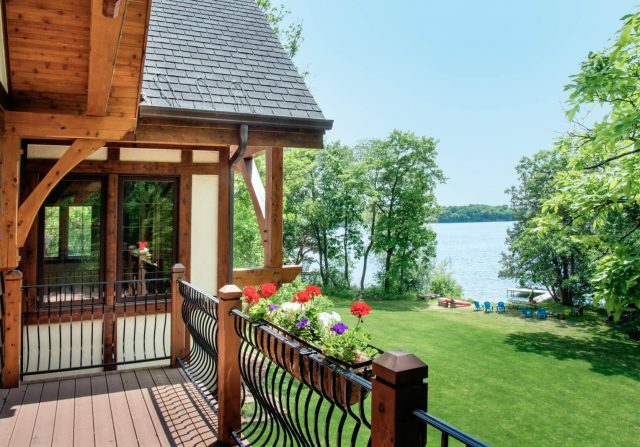 With warm-weather activities right around the corner, it is also the perfect time to think about your timber frame home’s deck or patio design. Where do you begin, and how do you know when your deck or patio is the ideal design for your lifestyle? 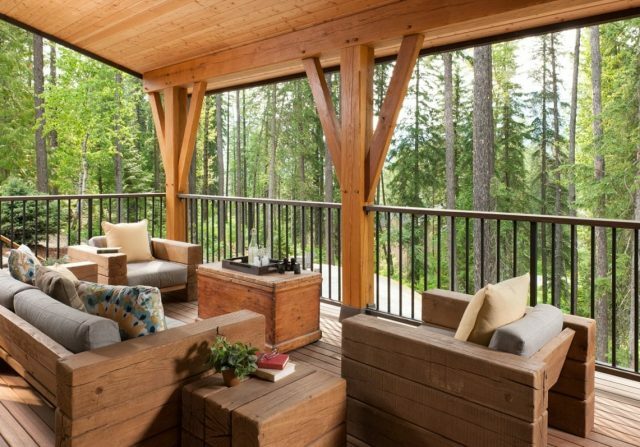 This article offers three important considerations for your deck or patio design. Whether you are thinking of incorporating a small, private patio off your master suite or envision an expansive deck outside your great room, the factors of function and form remain the same. 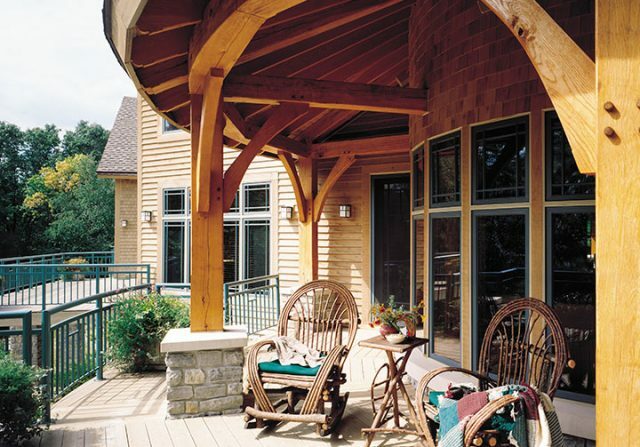 Today’s concept of decks and patios vary a great deal from that of previous decades. While hosting a barbeque, and enjoying an icy beverage on your deck never goes out of style, new approaches to decks, patios, and outdoor living itself have transformed these former summer spaces into three (or even four) season ones. This is why it is important you and your design team ensure your indoor spaces easily flow onto your deck or patio. Additionally, you should determine what rooms need access to your deck or patio. For example, if you want to utilize your deck or patio as a functioning outdoor dining space, an entrance to it via your kitchen is only logical. This will allow easy transfer of food, drink, silverware, etc. Considering a much larger space for use as an entertainment area? Access through a communal space, like your great room, makes the most sense. And, incorporating large french doors, or a glass wall that fully opens, will easily create an uninhibited flow during large gatherings. Upon determining access and flow of your deck, functionality arrives front and center. In other words, for what activities will your deck be used? Do you want to be able to prepare food on it, in addition to dining? Or does just having a simple barbeque suffice? Perhaps you prefer an outdoor living space designed for peace and privacy. The process of patio or deck design is no different from that of designing your timber frame home in that collaboration is key. From the beginning of the design process, share your dream of how you would like your patio or deck to function with your designer(s). Be specific. Knowing your patio or deck’s desired functionality allows your design team to create a layout perfectly suited to your home and lifestyle. With access, flow, and function successfully addressed, it’s time to determine the size and style of your deck or patio. The layout typically requires considerations around lot size, shape, and slope. For example, if you are building on a sloped lot, you may want a deck above the slope, below the slope, or both– or you may want a deck over a covered patio. Multi-level outdoor living is not only terrific for large groups, but it also provides dramatic visual appeal. Other items impacting the layout of your outdoor living spaces include your site’s orientation to the sun and the mobility of you, your guests, and your family. Finally, there is proximity to water. If your property is beach front, for example, it’s not uncommon for a deck’s form to gently follow the shape of the shoreline. Is there a charming brook on your building site? 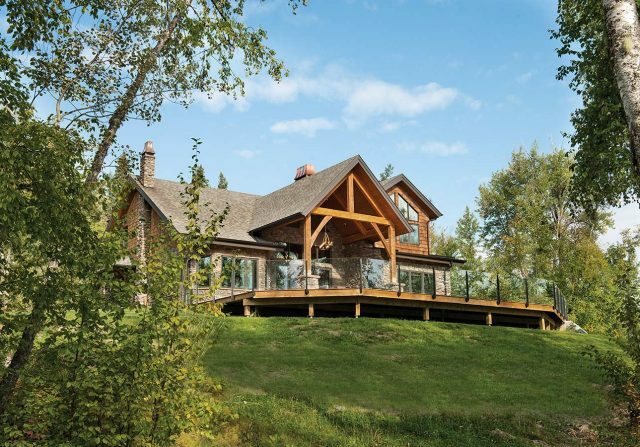 You might choose a layout that brings your guests right up to water’s edge while remaining safely above it or a layout that allows stair or tiered ramp access to the stream for wading, fishing, or an additional sitting area. Read about designing outdoor spaces here. For more about Riverbend outdoor living spaces, click here.